Hmmm.... Someone's beat-up senses are tingling. Dammit, Burk's totally going to come up against Ariara soon, isn't he? I mean, that was sort of predictable from the moment she first appeared, but still. Well, even if Burk does beat her, Ariara still wins the award for most badass. Why, exactly, is defeating Moe and Lacey a bad thing for someone to have done in Burk's eyes? Careful, Burk. Your noggin is a carefully-crafted weapon. Don't go using it for thinking and such, it might break. If Burk's plans made any sense, would he even be inside this castle? Pretty sure Burk wants to beat her up just because she's strong and there. Pretty sure Fang is right. He needs someone to beat up. 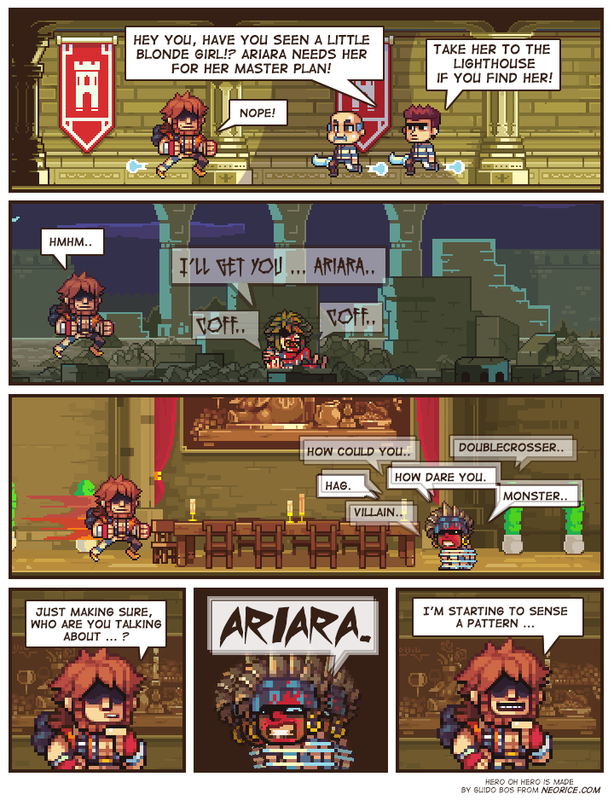 Ariara is looking pretty tough right now. Also, probably not in the castle any more, judging by the destruction done. Defeating escaped criminals like Moe and Lacey isn't necessarily bad (if Burke thinks of them as dangerous criminals in the first place; he's been known to not be extremely observant from time to time) but he also had the General's testimony that Ariara defeated the Judge before. If someone causes a castle to be evacuated by its guards and the convict call her a monster, that's probably an unanimous agreement that she's a bad guy. It's also possible that Burk thinks (heh) that Ariara killed the mage baron. The general wasn't exactly specific. @Neorice: That is an excellent point. @someone: The Judge and the guards were going to turn Moe loose, defeating them is a point in her favour.